Mar 15, 16, 22, 23 at 7 p.m. with special 2 p.m. matinees Mar 16, 17, 23. Quick As A Wink Theatre Society presents Baskerville: A Sherlock Holmes Mystery, directed by David Myles. Written by Ken Ludwig. Under the direction of David Myles (The Mousetrap), Baskerville: A Sherlock Holmes Mystery features local talent and returning Quick As A Wink actors, including Andy Ashdown, Isaac McWhinnie, Naomi Hammond, Frieden Gilbert, and 2018 Winkie Award winner for Featured Acting in a Play, Lilly Ashdown. Baskerville: A Sherlock Holmes Mystery is presented through special arrangement with Samuel French, Inc. All authorized performance materials are also supplied Samuel French, Inc.
FOR A MINIMUM $10 DONATION TO THE 1ST CANAL RANGERS, YOU WILL BE ABLE TO PREVIEW QUICK AS A WINK’S MARCH PRODUCTION, BASKERVILLE: A SHERLOCK HOLMES MYSTERY! Who: Quick As A Wink and the 1st Canal Rangers/Girl Guides of Canada are partnering to raise funds for a trip to England in 2020! What: Pay What You Can Show (min. $10). With a contribution of $10 or more per ticket, you are invited to preview QAAW's March production, Baskerville: A Sherlock Holmes Mystery. One hundred percent of the funds from the preview show will go to the 1st Canal Rangers fundraising efforts towards their trip to England in 2020. Why: When community comes together, everyone wins! Once you’ve donated, your name will go on a list for the front of house staff. You do not need to bring anything to the theatre with you! Thank you for supporting local community! Only funds from tickets purchased for the Thursday, March 14, 2019 preview show via this webpage or at the door the night of the performance, are part of the contribution towards the fundraiser. If you are unable to attend, you may still donate here and all of the donation will go to the 1st Canal Rangers. 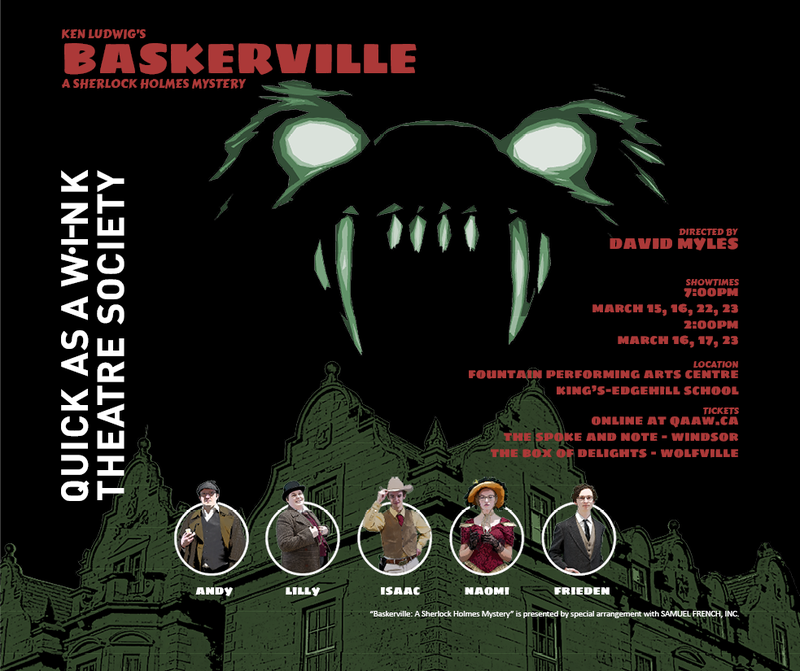 Baskerville runs from March 15 through March 23. For more details or to purchase tickets to our performances, click here (please note: this will bring you to a link where ticket funds do not go towards the 1st Canal Rangers. If you wish to donate money and attend the Thursday, Mar 14 preview show, you must click the Donate button above). Donations will not be accepted for this event at our local box offices: Spoke and Note in Windsor and Box of Delights Bookshop in Wolfville. Donating to this event gains you access to the Thursday, March 14 preview performance, and will not allow you admission to the regularly priced shows. QUICK AS A WINK THEATRE SOCIETY WOULD BE HONOURED BY YOUR PRESENCE AT THE 7TH BIENNIAL WINKIE AWARD GALA AND FUNDRAISER TO RECOGNIZE ACTORS, VOLUNTEERS AND BUSINESS PARTNERS. This event is our largest fundraiser to help offset the substantial costs of producing our seasons. *A Sneak Peak at our 2019 Season Opener: Oliver! Quick As A Wink Theatre Society presents Shrek the Musical, directed by Mike Butler with Music Direction by Michael Nelson. Music by Jeanine Tesori, Book and Lyrics by David Lindsay-Abaire. Tickets Available Sept 11, 2018 at QAAW.ca, in Windsor at the Spoke & Note, and in Wolfville at Box of Delights Bookshop. Register for one of two open auditions for QAAW's upcoming January 2019 production of Oliver! the Musical: Book, Music, and Lyrics by Lionel Bart. Sept 18 audition is at Evangeline Middle School and Sept 19 audition is at King's-Edgehill School. The Drowsy Chaperone tickets on sale now! Jan 26, 27 and Feb 2, 3 at 7 p.m. with special 2 p.m. matinees Jan 27, 28 and Feb 3. Quick As A Wink Theatre Society proudly presents The Drowsy Chaperone with music and lyrics by Lisa Lambert and Greg Morrison and book by Bob Martin and Don McKeller. The Drowsy Chaperone is presented through special arrangement with Music Theatre International (MTI). All authorized performance materials are also supplied by MIT. www.MTIshows.com. When wealthy widow Mrs. Tottenham hosts the wedding of the year, she gets a lot more than a write-up in the society pages: Janet Van de Graaff, glittering starlet of Feldzieg’s Follies, is leaving the stage for love, a turn of events which horrifies the angry and anxious Mr. Feldzieg, whose chief investor has sent two gangsters disguised as pastry chefs to make sure he stops the wedding. Hiring Aldolpho, a Latin lover more vain than virile, to seduce the bride, is unsuccessful, as Janet’s chaperone, a drunken diva, gets herself mistaken for the bride and seduced in Janet’s place. It is left to the eager best man, George, to quite by accident break up the happy pair, when he sends groom Robert Martin out to the garden, blindfolded, and in roller skates. Such are the antics of The Drowsy Chaperone, a fictitious 1928 musical comedy. This magical piece of meta-theatre and playful, heartfelt parody of the 1920s musical comedy features a chirpy jazz age score by Lisa Lambert and Greg Morrison, and a lively, clever book by Bob Martin and Don McKellar, both of which were Tony winners in 2006. The score boasts such tunes as the scenery-chomping “Show Off”, the sizzling and silly “I Am Aldolpho”, the double-entendre laden “Toledo Surprise”, and “As We Stumble Along”, that rousing anthem to optimistic alcoholism. Under the direction of Toven MacLean, with musical direction by Joan Whidden, The Drowsy Chaperone features local talent from several performers including Justin Brown, Becca Guilderson, Mike Butler and Sherri Bezanson. Supporting actors include Callie Mackintosh, David Foley, Isaac McWhinnie, Joanna Bond, Nicole Grass, Tyler Hall, and Max Cole. Please note: Moe's Place Music Sales is no longer affiliated with ticket sales for Quick As A Wink Theatre Society.